The Man Who Saved the V-8: The Untold Stories of Some of the Most Important Product Decisions in the History of Ford Motor Company (English Edition) bei Whooopeee - Günstige Angebote Online günstig bestellen. When Chase Morsey Jr. joins Ford Motor Co. in 1948, he has no idea the part he'll play in automotive history. Morsey's arrival comes as Henry Ford II and other titans in the industry are about to kill the vaunted V-8 engine. He sees it as his sole mission to talk them out of it. 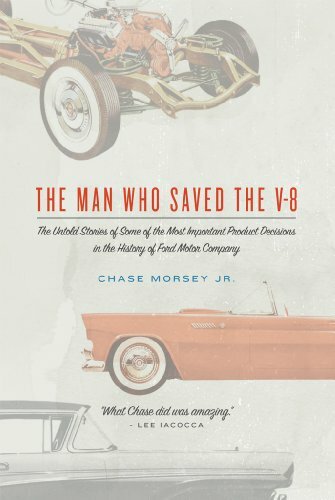 In The Man Who Saved the V-8, he shares the never-before-told story of how his crusade saved the engine that would go on to power iconic cars like the Ford Thunderbird and Mustang. "To this day, I have no idea how a young, newly hired manager like myself...had the nerve to challenge the most powerful men inside Ford Motor Company and tell them they were wrong," Morsey says. "But that is exactly what I did." The twenty-nine-year-old executive embarks on massive market research. He works with manufacturing experts to find ways to produce the V-8 engine more efficiently. After finding success, he goes on to continue playing a central role in some of the most pivotal decisions that would ensure Ford remains one of the powerhouses in the automotive industry. The Man Who Saved the V-8 tells the story of his successes and lessons learned.